Can you use biodiesel in the new low-emission diesel vehicles?? This is a question we get asked nearly every day. The answer is… YES, but you have to be careful and smart about it and take certain precautions that were not necessary with older vehicles. Read on to learn more! The latest “clean diesel” vehicles from VW, Audi, Mercedes-Benz, and BMW are equipped with a number of sophisticated emissions control devices, including high-pressure common rail injection systems, NOx catalysts, urea injection, and/or a diesel particulate trap. Biodiesel CAN be used in these vehicles in high concentrations, including up to B99. However, it is not quite as simple as it was in the pre-2007 vehicles, and requires more forethought and planning. This is especially true in vehicles that use in-cylinder post-injection such as some 2009-up TDIs and late model Powerstrokes. 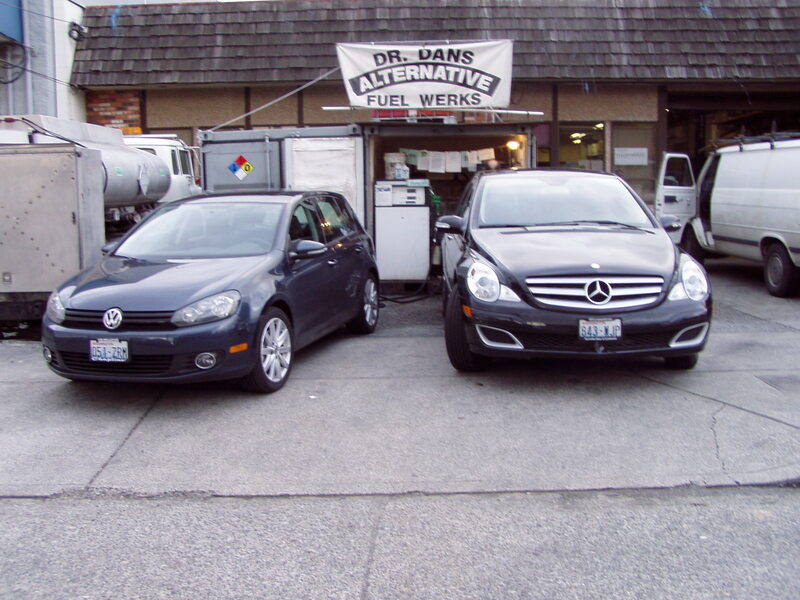 We have several customers that have been running B99 biodiesel in their brand new TDIs, Benzes, and Sprinters for tens of thousands of miles, with no trouble whatsoever. The key to their success has been in their driving patterns, which include mostly long-distance commuting and few short trips. For people who tend to use their cars for highway driving, biodiesel has worked great. For people whose routine includes mostly short-distance city driving and infrequent longer-distance highway use, using biodiesel may present some technical issues related to the more frequent DPF regen cycles necessary in cars that see lots of short trips. Our recommendation at this time is to stick to lower bio concentrations if this describes your use pattern. If you are thinking about running biodiesel in your new diesel, or are considering a new diesel for biodiesel use, we recommend giving us a call to learn all the gritty details and figure out if it will work for you. Contact us at (206) 783-5728 or stop by! 3 Responses to Can you use biodiesel in the new low-emission diesel vehicles?? Do any of your customers own a vw polo tdi 1.4 (2005) run 100% biodiesel in there car. is so would it be possible to let me know how the car has been running. We don’t have Polos here in the U.S., but we have many customers running B100 (B99.9) in their Golf and Jetta TDI’s of the same year with the same design PD engine. Any TDI up until the introduction of the common rail TDI’s equipped with NOx catalyst and DPF (2009 in the US) can run 100% high-quality, commercially-produced biodiesel with no problems. Thank you for this writeup. Do you still find b99 to be safe in the 09+ jetta tdi’s? My routine consists of a 60mi round-trip commute daily… At least 20mi of that is 70mph. Rarely do I have any short trips. I would love to run b99, but don’t want to create any other expensive issues.